If you’ve been keeping an eye out for brilliant casino promotions recently, then you can’t have missed the news about Sky Millions at Sky Vegas. This amazing event has loads to offer participants, thanks to its prize draws and daily treats. One of the most exciting parts of Sky Millions is The Prize Machine. 10,000 prizes are waiting to be won every single day in April with The Prize Machine. Keep reading to find out how one of them could be yours. As we’ve already mentioned, there are 10,000 prizes to be won daily in The Prize Machine. With each free spin you take on Sky Vegas’ Prize Machine, you will be in with a chance of winning cash, bonuses, scratchcards and much, much more. Make sure you also keep an eye out for Surge Days. These special days will pop up randomly throughout the promotional period and double-up the amount of prizes on offer to 20,000. You can enter this promotion every day of April. To get involved, sign into Sky Vegas and hit ‘Opt In’ on the Prize Machine page. The very next day after opting in, you’ll be invited to give the Prize Machine one free spin. There’s no limit to how many prizes each player can win with this offer. So even if you are one of the lucky 10,000 to land a winning spin on the machine, that won’t stop you from coming back the very next day and trying your luck again. 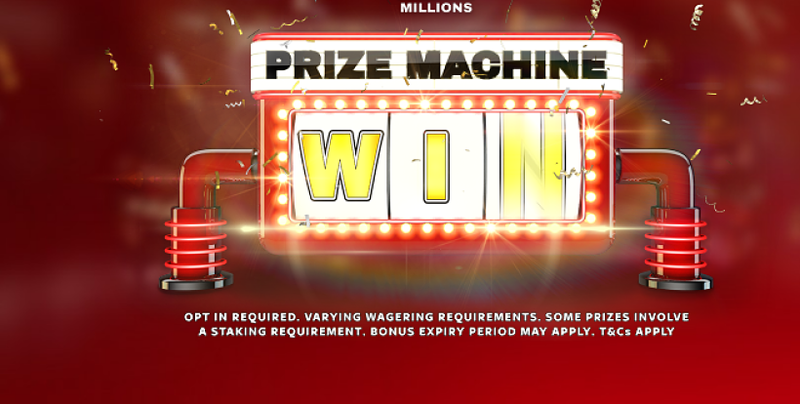 All registered members of any Sky betting and gaming site (including Sky Bet, Sky Casino and Sky Bingo) are welcome to take part in the Prize Machine promotion. The offer is limited to one entry per customer. That means once per person, family, household address, email address, IP address and bank account. The Prize Machine will be active at Sky Vegas from February 27th until April 30th. All players are welcome to a free spin on the machine between these dates. During the promotional period, the amount of prizes may be increased at the discretion of Sky Vegas. Each individual prize is subject to its own terms & conditions and wagering requirements.